UPDATE: Based on feedback from our community, the Edmonton Convention Centre has requested additional bike racks from the City of Edmonton. It’s expected new racks will be installed in the summer of 2018. If there’s one defining feature of Edmonton’s landscape – one cherished spot that gives our city a uniqueness and a sense of place, it’s our backyard, the River Valley. This winding strip of blue and green carved out by the North Saskatchewan River is a cord that binds the city together. The River Valley is a natural pathway to the downtown core, and the convention center’s location makes it a convenient access point to the street for hundreds of other bikers who use it as a connection point. Each day Edmontonians can be seen rolling their bikes onto our escalators. It’s not by coincidence. There’s a bit of a story to how the Edmonton Convention Centre started embracing bike culture. It all started with a rogue City Counselor and his bike. Tooker Gomberg was renowned for his love of biking; it wasn’t uncommon to see him pedaling out on the trails or whizzing by on city roads. But it was when Tooker started using the convention centre’s escalators for easy access to the River Valley that the conversation really got going at the Edmonton Convention Centre. Edmonton was already looking for ways to accommodate and facilitate bike travel across the city as part of an impressive and ongoing push for sustainability. Transit rules were changed to allow two-wheeled commuters to bring their bikes on LRT lines during non-peak hours. Bike racks were popping up on city buses, greatly expanding the distance bikers could cover. So when Tooker and a sparse few other bikers started taking the escalator, the convention centre saw an opportunity to be a unique part of this exciting change. We knew we could do more to take advantage of our proximity to the river and make bikers feel welcome. Security was encouraged to allow bikers to use the escalators, and we began having discussions as to how we could better to accommodate them. Soon, the Edmonton Convention Centre became known as the most convenient way to get down to the River Valley without climbing stairs or rolling down hills, and seeing bikers riding the escalators was commonplace. 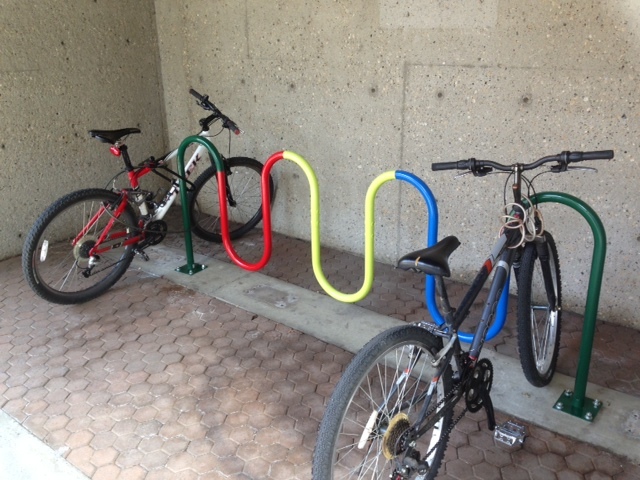 Bike racks were also upgraded on the Jasper Avenue and Assembly levels of the venue. That’s a good start, but there’s still more we can do! As Edmontonians, our history is on the river; a highway of commerce and a place of meaningful connection stemming back to the days before our city even had its name. Sustainability and going green are woven into the fabric of who we are, and it’s been so exciting to see the paths we’ve traveled together toward a clean, sustainable future. But it’s time we continued pedaling towards progress. We want our backyard to be more than a visual delight for visitors and become place of physical interaction and memorable experiences. Together, we want to find ways to stay connected to this important asset and encourage people to bike, walk, get out on the water and explore in new ways. For bikers in particular, that means taking action on ideas like bike lanes for commuters, making it even easier to get in and out of the core in a way that’s planned, convenient and safe. It may mean embracing bike parking, opening up a space for secure storage while people do business downtown. Perhaps it will mean hosting more bike-related events, or opening discussions about ways to help the biking community come together. Here’s where YOU come in – we want your ideas! What would you like to see the Edmonton Convention Centre do to become more bike-friendly? What more could we be doing to encourage you to wheel through our building and reconnect with the River Valley? These aren’t rhetorical questions. We’re looking for feedback that we can turn into action. Please send us your ideas, suggestions and comments on how the Edmonton Convention Centre can help facilitate and improve the way we’re embracing bike culture by contacting us here.